20:00 pm. – Opening ceremony: Time to tune. 7:00 am. – Sunrise. Paneurhythmic exercises. Silent walk in nature finding a symbol from nature for the inner state of the day. 9:00-9.30 am. – Welcome and What have I come with in my heart and mind? Weavers Present. 9.30-10.00 am. – What can we offer in the days to come? 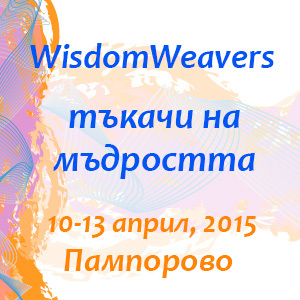 – The Spirit & Process behind WisdomWeaving, Agota E.Ruzsa. 10:00-10:45 am. – What does our land tell us about all that? „Here is the Man“. The image of man according the Master Beinsa Douno. (Starting with music of Beinsa Douno (Peter Dеunov), Dr. Svetla Baltova. 11:00-11.40 am. – „ Who am I? „Group morning session I. – reflection dialogues and co-weaving on the given presentation. 11.40 – 12.10 am. – From the „I” to the „We”. Agota – Zhivko -Yanina – reflection on Svetla and the group. 12:10-12:50 am. – Group morning session II. – reflection dialogues and co-weaving on the given presentation. 14.30-15.00 pm. – Short mindfulness meditation and seeing where I am in my life. 15:00-16:30 pm. – Integral constellation. 16:30-17:00 pm. – Nature and nurture – group walk. 17:00-18:30 pm. – Yanina Taneva – “Homo Ludens I”. 18.30-19.00 pm. – Loving Kindness meditation. 7:00 am. – Sunrise. Paneurhytmic exercises. Silent walk in nature and find a symbol from nature for the inner state of the day. 9:00-9:30 am. – Coming to Presence – What have I come with today in my heart and mind? – group sharing. 9:30-10:15 am. – Agota Ruzsa – Global Transformation in relation to the 7 Ray metaphysics and spiritual psychology (Starting with music of Beinsa Douno (Peter Dеunov). 10.15-11.00 am. – Group morning session I – reflection dialogue on the given presentation. 11:00-11.30 am. – What does it all tell us? Svetla, Zhivko, Yanina Reflection. 11:30-12:30 am. – Group morning session II. – reflection dialogue on the given presentation. 12:30-13.00 pm. – Emergence Space in the group – large group opening. 13:00-14:30 pm. – Lunch and Personal time for Reflection, Journaling and Meeting with Nature. 14:30-16:00 pm. – Dr. Svetla Baltova – „Paneurhythmic exercises – the link with Nature”. (outside practice). 16:30-17:10 pm. – 7th Ray-Living systems-Systems Feeling and Compassionate Action. 17:10-18:30 pm. – Yanina Taneva – “Homo Ludens II” . 18:30-19:00 pm. – Loving Kindness meditation. 20:00 pm. – Open Space – Evening celebration (Easter). 7:30 am. – Sunrise. Paneurhytmic exercises. Silent walk in nature and find a symbol from nature for the inner state of the day. 9:00-9:30 am. – How am I? What is emerging in my consciousness? group sharing. 9:30-10:15. am. – Zhivko Stoilov – „Structures/levels of Consciousness according to Integral Philosophy of Ken Wilber linked with Beinsa Douno teachings and the 7 Rays”. (Starting with music of Beinsa Douno (Peter Dеunov). 10:15-11:00 am. – Group morning session I – reflection dialogue on the given presentation. 11:00-11:30 am. – What does it all tell us? Agota, Svetla, Yanina. 12:30-13.00 am. – Emerging Tapestry of New Consciousness and Compassion in Action – large group reflection. 13:00-13:30 pm. – Loving Kindness meditation and a Farewell Dance of Beinsa Douno. 13:30-14:30 pm. – Lunch and Farewell.